If it's small, but not far away, then it's unlikely you will need to register your drone with the IAA. 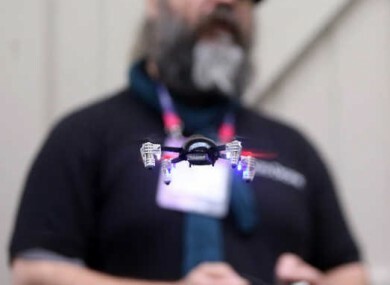 STARTING FROM TODAY, those who own drones or unmanned aircraft weighing a kilo or heavier must register it with the Irish Aviation Authority (IAA). The new rules, which were announced late last week, come into effect today and can be registered by visiting iaa.ie/drones. The weight of the drone includes the battery and all attached equipment when flying. The registration process is broken up into two main steps. The first step is to register with ASSET, an online terrain mapping system, while the second is registering your drone and location details. When completed, you can check the ASSET map to check your location and see if there are any restricted areas nearby. If you own a drone or unmanned aircraft that weighs more than 4kg, you will also need training to pilot one. Those with lighter drones or aircraft don’t so long as they stay within the limits set, but the IAA does recommend that owners take a safety training course. There is no limit to the number of drones you can register, and registration is free until the end of January where it will then cost €5. The registration will cover users for up to two years. If you own a drone that weighs more than 1kg, these are the main points to keep in mind. You can’t fly in restricted airspace (that means civil or military airspace, urban areas like villages, towns and cities, and anywhere within 5km to an active aerodrome). You can’t fly over people or within 120 metres of any person, vessel or structure not under the control of the person controlling the drone. You can’t fly higher than 120 metres (400 feet) above ground level, and you can only fly your drone no further than 300 metres away from you. It’s recommended you have insurance for your drone. If you’re flying over private property, it’s recommended you have permission from the landowner first before doing so. If you want to fly a drone outside the limits noted above, you will need to apply for permission with the IAA. While the new regulations come into effect today, EU legislation is still pending and will likely come into effect in 2017 or 2018. When it does, the current legislation will be reviewed and will incorporate any changes made. While the 1kg mark might seem a little arbitrary, there is a good reason behind it according to the IAA’s director of safety regulation Ralph James. If they were to go any lower, they would be inundated with registrations. It’s expected that the majority of drones bought for Christmas will be toy drones and won’t cause problems, but it’s not a hard and fast rule. If you feel it can travel significant distances, or it can go higher despite it weighing less than a kilo, then it will need to be registered. “If you build something that’s half a kilo, is metal and can travel at 50 km/h, that is going to do damage [if it crashes] and we expect you to come into us and register that,” says James. We went for [registration] because ASSET means we’re giving everyone the information in hand… If somebody registered a drone and they live near restricted airspace, we’ll be able to target and say you are in an area that’s restricted, keep in touch with your local airfield [before you fly]. Throughout the new legislation, safety is the main issue that crops up again and again. Unlike RC planes or helicopters, drones are significantly easier to pilot thanks to the many built-in safety features in place. Yet with any device, problems can emerge because of extreme weather, a malfunction or something else entirely unforeseen. The chairman of the Unmanned Aircraft Association of Ireland (UAAI) John Wright says that while piloting them can be seen as “deceptively easy”, you should not allow that to cloud your better judgement. “Just like a learner driver can get into a car and make it move, that doesn’t make them a good driver,” he says. “With a drone, you can have it in the air in minutes but that doesn’t mean you can do that safely”. What’s really important is you look at training, you look at regulations… responsibility is where it all starts. It’s a sentiment echoed by the chief flying instructor of iFly Technology Oisin McGrath who says the training really comes into play for “outside the box” moments where things go awry. “The training part of it is more about risk management, safety management, where you can and can’t fly,” he explains. “There’s going to be a point where something will fall from the sky and that’s when people need to be aware [of what to do]. That’s where the training comes in”. The flying is so easy… but you need to be aware of where I am taking off from? What airspace am I in? Are there other aircraft around? What’s the weather like? As for those getting a new drone for Christmas, the advice from all three is clear. As tempting as it is to take your drone out and start flying it immediately, it’s recommended you take a few minutes to look through the guidelines and know what you can and can’t do. Further information about rules and guidelines can be found on the IAA website. Email “Own a drone or buying one for Christmas? You have to register it from today”. Feedback on “Own a drone or buying one for Christmas? You have to register it from today”.